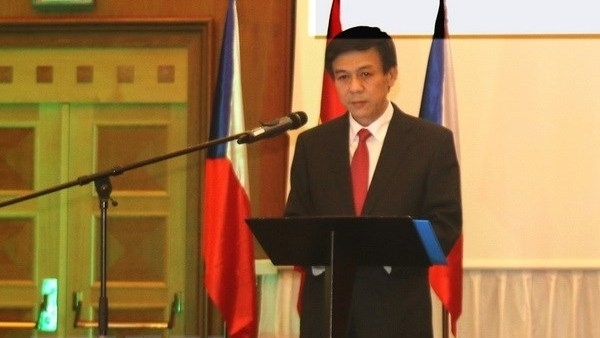 The Vietnamese diplomat made the statement while meeting with Governor of the Pardubice region Martin Netolicky on April 25, during which Tuan highlighted the fruitful cooperation between Vietnam and the Central European country in the past time. The cooperative ties have been consolidated after visits of the two countries’ senior leaders, he said, adding that the successful organisation of the 6th meeting of Vietnam-Czech Republic inter-government committee in Hanoi in mid-April also contributed to bilateral relations, especially economic and trade bonds. At the meeting, Tuan introduced Tuyen Quang province’s strengths and cooperation potential to the Pardubice region’s leaders. He noted that the Vietnamese mountainous province wishes to cooperate with the Czech partner in the fields of agriculture, food, environment and healthcare. Martin Netolicky, for his part, said that he wants to set up partnerships with Vietnamese localities based on potential and interests of both sides and via specific projects. Pardubice is in need of some 500 highly-skilled workers in industrial production, he said. Both Tuan and Netolicky lauded the Vietnamese people community’s integration and their significant contributions to the host country. Netolicky affirmed that he will introduce a representative from the community to the local ethnic minority council. Pardubice region will continue to create favorable conditions for Vietnamese people to stabilize their livelihoods and preserve their cultural identity, he affirmed. Pardubice region is located in the eastern part of the Czech Republic with a total population of 500,000 people. It holds advantages in agricultural and industrial production like manufacturing, garments and chemical industry.